Maragheh, Iran, 1297-1298 or 1299-1300, and 19th cent. Formerly bound in reddish brown morocco, ca. 1297-1300, blind-tooled (stored separately as MS M.500A); shortly after the manuscript came into the possession of J. Pierpont Morgan the covers were set into a leather frame to protect the extensions to the edges of the leaves; this frame was removed in 1991, and the manuscript was unbound; the former binding is now stored separately; rebound in 1992 by Deborah Evetts in quarter terracotta morocco with natural Irish linen sides. Shams al-Din ibn Żiyāʼ al-Dīn al-Zūshkī, who was the patron; Bayezid II, Sultan of the Turks (1447 or 8-1512; ruled 1481-1512); his seal on fol. 2 and 84v; M. Vignier, Paris, ca. 1910 who bought it in the art market in Tehran; purchased by J. Pierpont Morgan (1837-1913) from Percy Moore Turner, Paris, 1912; J.P. Morgan (1867-1943). Ms. translation from Arabic into Persian; written and illuminated in Maragheh, Iran, on the 11th of ... 600 and 90 (i.e., either 1297-1298 or 1299-1300). The translation is by ʻAbd al-Hādī ibn Muḥammad ibn Maḥmūd ibn Ibrahīm al-Marāghī, which he made at the command of Ghazan Khan, the Mongol ruler of Iran (ruled 1295-1304). Dated in the colophon on fol. 84v. During a 19th cent. or early 20th cent. restoration, considerable inpainting and overpainting was done, and new miniatures were added. These are on folios 3v, 6v, 23v, 25v, 36r, 47v, 58v, 72v, 78r, 78v, and 84r. Decoration: wove paper which ranges from thin to medium thick; text written in black ink with important words in red ink; illuminated heading on fol. 2 written in white muḥaqqaq on a lapis background; illuminated shams (sunburst) medallion with the name of the patron on fol. 2r; 103 miniatures; text and some miniatures are framed by two concentric red lines; other miniatures have gold frames; following fol. 60 headings are written in Arabic rather than Persian. The illumination of M.500 is unfinished. On fol. 83r a blank space was left for a miniature, which was never painted. 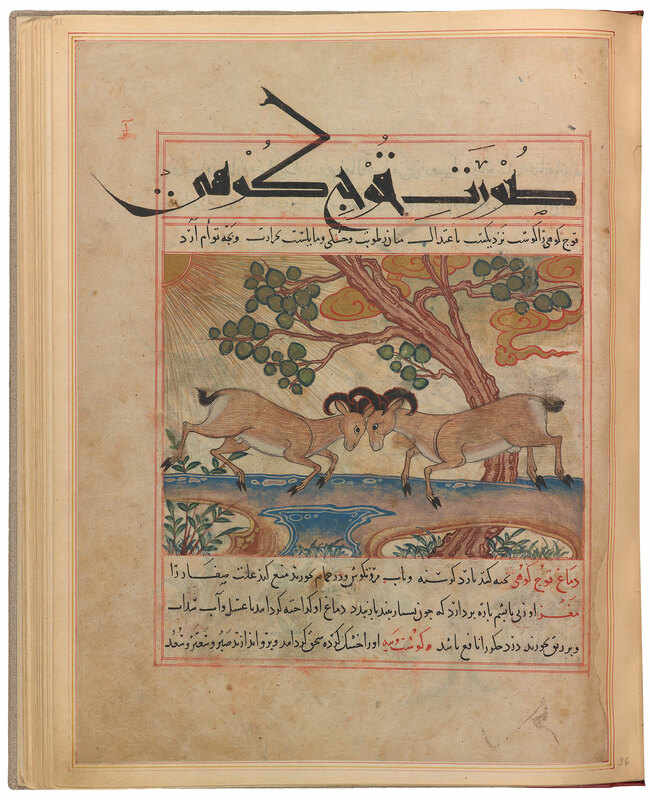 This book, ranked among the ten greatest Persian manuscripts, dates from the reign of Ghazan Khan (1295–1304), the Mongol ruler who ordered the Persian translation. The Mongol invasion, culminating in the conquest of Baghdad, influenced the development of Islamic painting. The Mongols brought a new, naturalist Chinese style to Persian art, which is reflected here. The text discusses the nature and medicinal properties of man, animals, birds, reptiles, fish, and insects.